Hubby and self caught first screening of “Captain America” at Redwood City Century 20 on Saturday. Self’s assessment: this movie is way, waaaay better than it has any right to be. The actors are way better than they have any right to be. Self means: Tommy Lee Jones (How self loves this actor’s inflections. His delivery should be enshrined in the Smithsonian Archive of Great Deliveries). And Stanley Tucci, OMG. Can anyone hope for a mentor with more kind avuncularity than Stanley Tucci? “The Lovely Bones” was a horrible mistake. Please always have Stanley Tucci as the wit and intelligence in any future super-hero movies. Oh yes, Hugo Weaving is in this movie, and at least until he reveals his face to be something like Hellboy without a nose, his eyebrows are wickedly entertaining. Also, the short guy who played Naomi Watts’ only friend in “The Painted Veil,” and who played Truman Capote the same year that Philip Seymour Hoffman played Truman Capote, is in this movie as a sidekick scientist. Hopefully we will see him in future installments. Howard Stark (who self kept confusing with Tony Stark of “Ironman”, even though Robert Downey, Jr. and Dominic Cooper are obviously not the same actor) was in this movie. It takes cinema aficionado clothesonfilm to reveal that Stark was based on eccentric billionaire Howard Hughes. The girl had big hooters. Also, her mouth looked excellent in matte red lipstick. And, now that self has time to ponder, it is clear that the 1940s were a time for all women to sport similarly vermilion lips. For self still remembers execrable “Pearl Harbor,” where Kate Beckinsale had a very similar look. Self loved looking at all the nail polish in this movie. One wizened grandma wearing a housedress and wielding a machine gun has bright, scarlet nail polish, a dead give-away that she is working for our side! OK, what else? Oh, there were action scenes, of course. Self found herself catching twenty winks during. But never mind. There was a very amusing assemblage of “types” assembled by Captain America to carry out his top secret mission, and self recognized the baby blues of the guy who was in “Minority Report,” playing Tom Cruise’s ex-best friend. Here, he wore a bowler hat, even after he was freed from prison. And he had a ridiculous Otto von Bismarck-type moustache (veeery hairy). Yes, this action movie does contain one musical number, and it was pure popcorn — i.e., very enjoyable! Self was absurdly entertained. From first to last. Charlene Witstock, now the wife of Prince Albert of Monaco, was stopped at the airport after she bought a one-way ticket to her native South Africa. With her wedding only a few hours away, and the pride of all Monaco at stake, her passport was confiscated and she was forced to go through with the wedding. Self has seen pictures of the weepy bride. Her heart goes out to her. Mila Kunis and Justin Timberlake were photographed at the premier of their “Friends With Benefits.” OMG, Mila was positively glowing — due to a $7,000 facial the previous week. Mila Kunis is young, and beautiful. She doesn’t need a facial — she needs to have her brain examined! News Flash! A Musical on Cory Aquino! How long has self been waiting for this to happen? Ever since self read a line from an American novel that went: “At least, no one expects me to get out of bed and be Cory Aquino today!” she has known that Cory, the Musical, must eventually come to be. Courtesy of new FB friend Jude Cartalaba, comes this news flash! To which self can only respond: FAB! FAB! FAB! The musical is called “Cory ng Edsa” (Nice title!). It is produced by Philippine Stagers Foundation, in partnership with the Ninoy and Cory Aquino Foundation. It had its official premiere at the College of Saint Scholastica, Manila, on July 16. And lest she wear out dear blog readers with her excitable superlatives, she’ll put the link to an article about the current Philippine tour, here. Mélanie Laurent was the French actress whose fiery revenge brought down the house (literally) in Quentin Tarantino’s hugely satisfying re-imagining of World War II, “Inglorious Basterds,” a few years ago (Why does 2009 already seem like a whole other era?). Melanie: But I must go! Melanie: Anywhere! Only to be free! Because I am completely driven by my moods! And living in the same house for 10 years is driving me crazy! Ewan: Oh, how adorable. My little kitten, I adore you. McGregor is very stoop-shouldered, in this movie. His head seems rather large for the rest of him. There is a lot of soliloquy, a lot of detachment, a lot of old photographs, a lot of bittersweet reminiscences. The Jack Russell terrier is very smart. That cute Yugoslavian actor, Goran Visnjic, who self adored in “The Deep,” with Tilda Swinton, has very oily-looking hair, in this movie. Christopher Plummer, as McGregor’s gay dad, and the actress who plays Plummer’s passionate, frustrated wife (Self needs to look up her name, pronto! ), are spectacular. Self felt the sadness of their characters — perpetually stuck, but dignified. All their unrequited longing gets dumped on poor Ewan McGregor, who then develops some very serious relationship issues. But, fortunately, Mélanie Laurent with her big, goo-goo eyes and her studiedly nonchalant laugh is there to save the day! Self must say, of Mélanie: She looks ravishing in red. Also, when she is not having to look at McGregor, and has to project some interiority, she is very beautiful. Son arrives tomorrow. Self was in a mad frenzy of cleaning house, today. That was why she saw fit to reward herself with a movie. Unfortunately, about an hour in, self’s eyelids kept drooping. In addition, today self added two more books to her reading list: one by Dutch writer Harry Mulisch, The Assault, and our old friend Dostoyevsky’s masterful Crime and Punishment (which self first read over three decades ago). The places self has never been to, and that she so longs to visit someday, are Cape Town, India, New Zealand, and Stockholm. Self read with Donna Miscolta in Seattle, a few years ago. She remembers listening to Donna and thinking, Now that’s a really good writer! 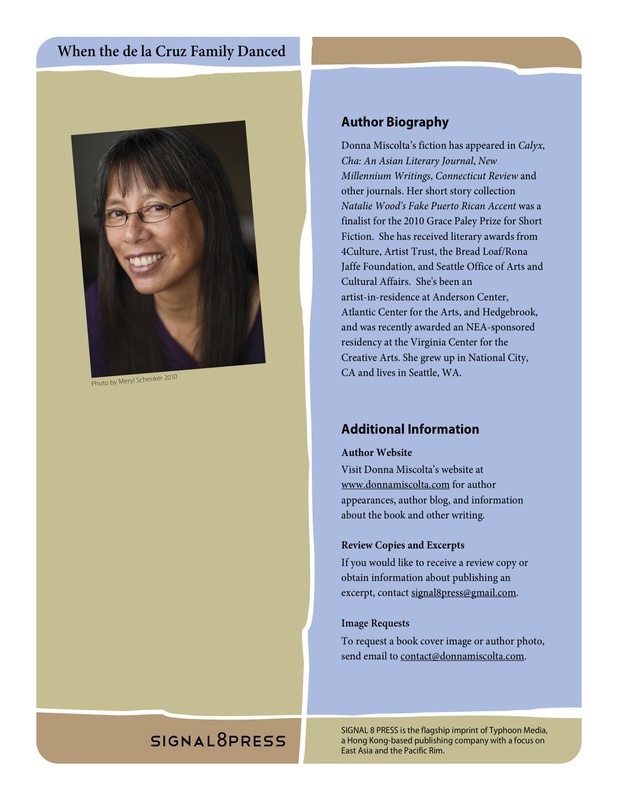 Recently, self saw Donna’s name on the shortlist for a prestigious short story collection prize — might have been AWP? 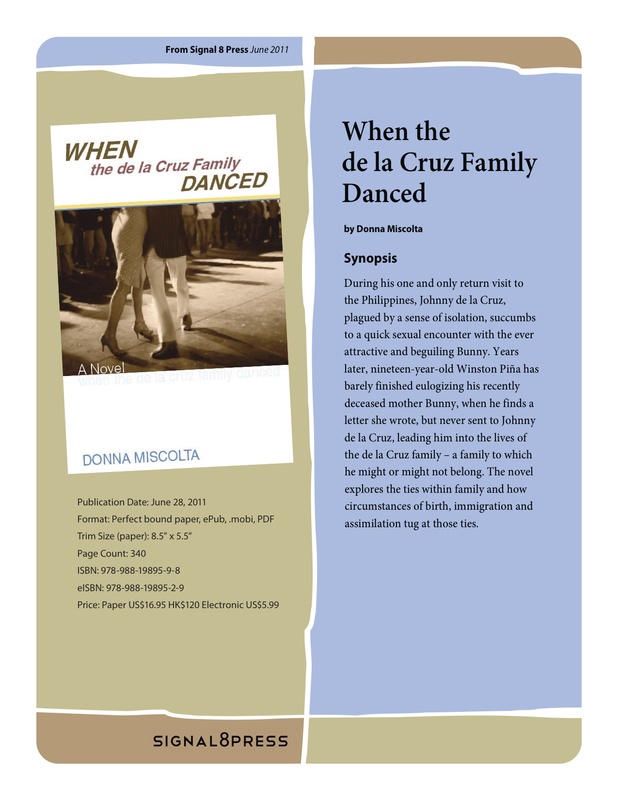 When the De La Cruz Family Danced is available now from Powell’s, Indiebound, Amazon, or Barnes and Noble. 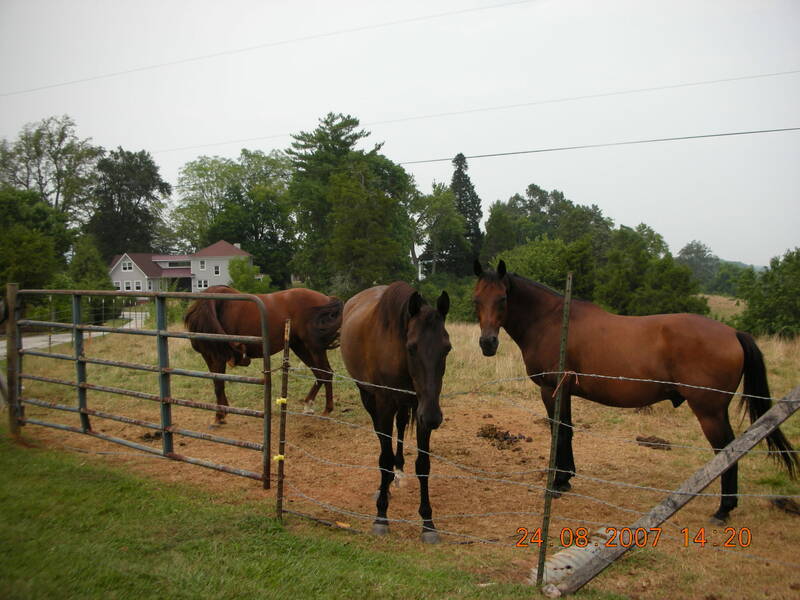 Are there still three chestnut horses in the field between the barn and the main house? 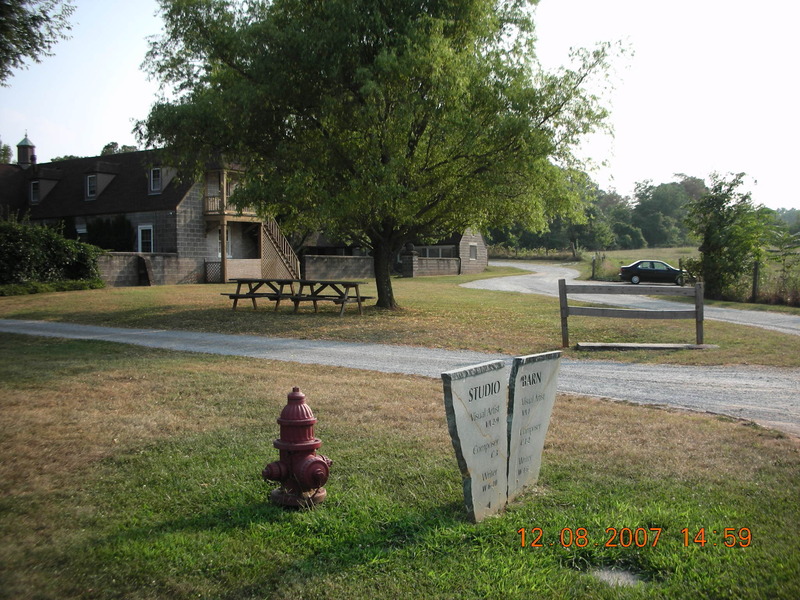 Oh, the bucolic VCCA fields! Even the fire hydrant looks so -- post-modern! Drew sent self a music file: himself playing the piano and singing, our opera, Scene 1. Self’s hair absolutely stood on end! * This just in: “Ang Babae sa Septic Tank” screens in Philippine Theaters nationwide, starting Aug. 3. Delany started this project as a widow in her eighth decade. Despite grief, ageing hands and eventually failing eyesight, she invented a new method for creating her flower “mosaicks” : collaging layers of cut, painted paper onto a dense black background, matching her materials to the papery fineness of a flower’s petal. In Molly Peacock’s illustrated biography, the results leap out of the darkness of the past, pulsating with life. 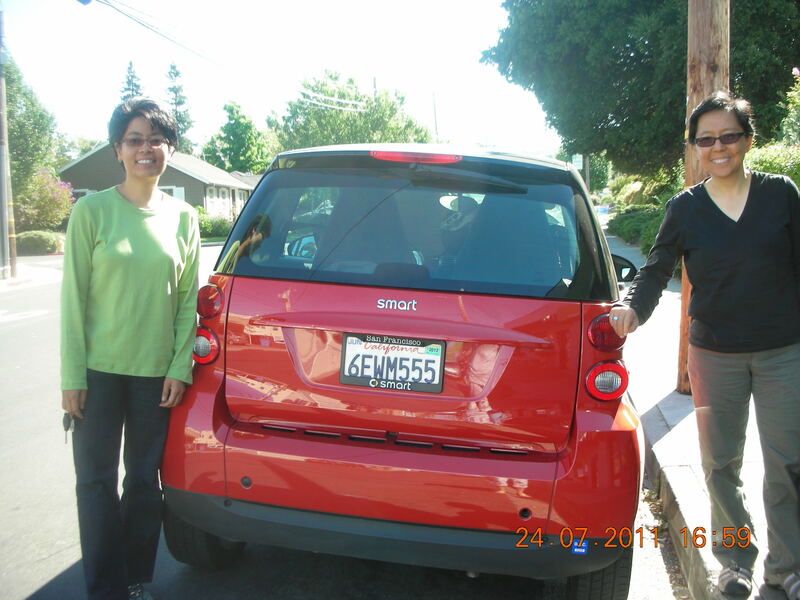 Self is in love with Stella and Tina’s bright red Smart car! Capable of reaching freeway speeds of 100 mph! Is it not so adorable, dear blog readers? This little thing ferried Stella and Tina all the way to San Carlos yesterday, where self met with them for coffee and pastries at the Zest Bakery on Arroyo Street. Self must admit, there was something wee bit different about the appearance of her two friends, and finally, after two hours or so, she learned why: they have each lost something like 20 lbs.!!! Mama mia! How did that happen? They explained that it had something to do with sticking only to gluten-free food, and becoming vegan. Anyhoo, Happy Monday to One and All!